Fig. 14.1 Trends in catch of the Far Eastern sardine, 1894-1988. Statistics of DPR Korea are not available. reaching a peak catch of about 1.2 million metric tons (comparable to that along the Japanese coast). This peak occurred mainly along the northern Korean coast in 1937. All fishing ceased there in 1943, when sardine schools were no longer found in the area. On the other hand, sardine fishing by the USSR continued between 1930 and 1946. Korea since 1976 and the USSR since 1978. North Korean catch records have not yet been made public. The sardine fishery during the Taisho era (1912-26) has been inseparably linked to the development of purse seines. The annual catches of sardine by offshore purse seiners larger than five metric tons in Japan was under 10,000 mt between 1915 and 1921, but increased to over 20,000 mt between 1922 and 1925. After the beginning of the Showa era (1927-88), catches increased rapidly from 50,000 mt in 1927 to 300,000 mt in 1936. 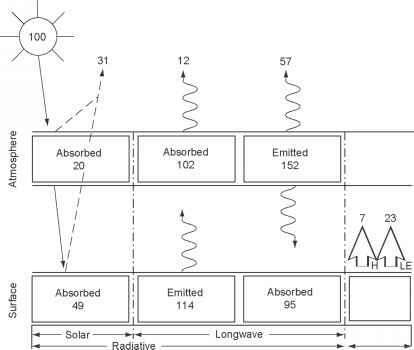 These increases were made possible by targeting the sardine for the purse seine (Fig. 14.2). Fig. 14.2 Offshore seine fisheries around Japan, 1915-40 (Ounabara, 1980). Between 1915 and 1940, most of the sardine catch was in the coastal fisheries; catches by offshore purse seines made up less than two percent of the total sardine catch until 1921 and only four percent each year between 1922 and 1927. As powered purse seiners were developed and brought into the fishery, the percentage exceeded 10 percent after 1928, but it was not until 1940 that it exceeded 20 percent. Average tonnage of the offshore purse seiners was 15 mt and the total number of boats, each of which was manned by a 15-person crew, somewhat exceeded 1,000 around 1940. About one-fourth of the sardine catch in those days would be ascribed to this fleet. As the sardine stock expanded, the average tonnage as well as the proportion of power-driven purse seiners in the fleet also increased (Table 14.1). Catches of sardine by both the offshore and coastal purse seiners in 1941 were about 750,000 mt, accounting for 77 percent of the total sardine catch (about 970,000 mt). The purse seine fisheries in pre-war times, after 1926, were the core of the sardine fisheries and in this regard the former was almost synonymous with the latter. In pre-war Korea (then under Japanese control) the purse seine fishery for sardine developed more rapidly than in Japan proper. The sardine fishery off the eastern coast of the Korean Peninsula, especially the northeastern portion, had developed since the sudden appearance of sardine there in the fall of 1923. Subsequently, catches peaked in 1939 and 1940 and declined rapidly thereafter. Powered purse seiners, operating along the eastern Korean coast in 1927-41, increased in number from 61 to 598, or about one order of magnitude (Table 14.2). Needless to say, the tonnage and horsepower of fishing vessels also increased during this period. In the heyday of the fishery, around 1940, fleets were composed of 50-ton vessels, equipped with an engine of 130 HP and wireless, and manned by a crew of 50 men; sometimes airplanes joined them to locate schools of fish. In 1936, 70 percent of the total sardine catch along the eastern Korean coast was obtained by the powered purse seiners. It has been said that the number of fishing boats steaming from Japan proper amounted to 110 in the fishery's heyday. This huge fishing power, however, declined with the fall of sardine stock. Japan entered the period of high level economic growth in the 1960s and the purse seine fishery was developed as part of that economic growth. The fishery improved due to the invention and dissemination of labor-saving devices, by the structural reform policy for the elimination or reduction of labor, and as a result of the increase in availability of chub mackerel and the recovery of the sardine stocks. Fig. 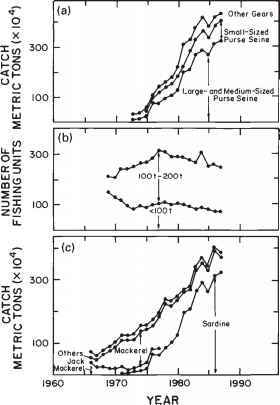 14.3 (a) Sardine catch by fishing categories, 1973-87, (b) number of large-and medium-sized one-boat purse seiners by tonnage classes, 196987, and (c) catch by large- and medium-sized purse seiners by species, 1966-87.
larger boats (between 100 and 200 mt) as well as a decrease in smaller ones (under 100 mt). Since then, there has been a decrease in the number of both larger and smaller boats. 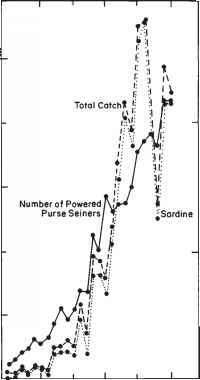 This shows that the fishing capacity of each purse seiner became more powerful as a result of progress in the development of modernized fish school-locating techniques and electronic fishing devices. Catches by the large- and medium-sized one-boat purse seiners have increased rapidly from 300,000 mt in 1967 to four million mt in 1987, a change of more than one order of magnitude. During the late 1960s, while the stock size and, hence, catch of jack mackerel were still large, there was an increase in the abundance and catch of chub mackerel. Moreover, the sardine stock began a dramatic increase in the 1970s. The catch has skyrocketed since then, reaching a level of more than three million metric tons in 1987 (Fig. 14.3). Thus, most of the recent increases in fish catches by large- and medium-sized one-boat purse seiners has been ascribed to the Far Eastern sardine. Trends in sardine catches by respective fishing categories show that most of the sardines have been caught by large- and medium-sized purse seines (Fig. 14.3).